The city of Lakewood is continuing its effort to stabilize and grow the historic Birdtown neighborhood. 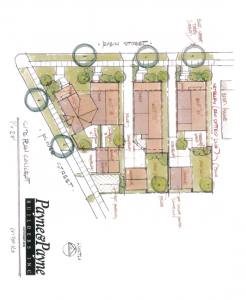 The city’s planning and development department has partnered with Payne and Payne Builders to construct a transformative mixed-income infill housing project in the heart of the Birdtown neighborhood. “The idea is to increase the presence of high quality owner-occupied housing in Birdtown while ensuring the neighborhood remains affordable for low-moderate income residents,” said city planner Jason Russell. The project site consists of three adjoining city-owned parcels at the corner of Plover and Robin streets. The conceptual project will include four new single-family homes. Two homes will be reserved for low- to moderate-income residents. “We hope this project will prove that substantial home rehabilitations and market rate new construction is viable in Birdtown as it has been elsewhere in the city,” said Jason Russell. Located in the city’s southeastern corner, Lakewood’s Birdtown neighborhood has a rich heritage and quaint, historic homes. Originally built as housing for Union Carbide (now Graftech) employees, the neighborhood among the oldest in the city. Now, the city is looking to prepare the neighborhood for its second century. Payne and Payne Builders was selected through a competitive request for qualifications process. As a company, Payne and Payne is well known for high-quality homes and communities throughout the eastern suburbs of Cleveland. This project represents an entry into the growing urban infill market for the company. During the past decade, Lakewood has invested more than $1 million of its federal funds to strengthen and revitalize Birdtown through housing rehabilitation, demolition of nuisance properties, infrastructure improvements, first time homebuyer and down-payment assistance, and the renovation of commercial storefronts.